The only person in town who ever called Anna Reed by her Inupiak name was her husband. And he was long dead. Like the other eskimeaux around, she had moved south in the wake of the blood trail brought by Russian fur traders years ago. She was the only one from her village to make it, and at the time the Doctor in Red Boulder had to remove two of her toes because of frostbite. Still, he sent her to Emma’s House of Pleasures as soon as she could walk. What else was he supposed to do? For her part, Emma said the tattoos on the girl’s chin might be a deal-breaker. Then again, who knew? Maybe some clients would find it exotic. She agreed to take her on. But it wasn’t to be. And soon Emma was glad to be shut of the willful girl. Anna simply refused to work for her. At that point, the prospect of starvation was every bit as real as when the Russians decimated her village and killed her father. Fortunately for Anna, the saloon owner’s wife took pity on her and hectored her husband into hiring the girl as a cook and scrubwoman. Sheriff Reed, a widower and a regular at the saloon, eventually fell for her and married her. It wasn’t the way things usually went, but it wasn’t the strangest set of circumstances either. And it almost ended well. But the sheriff was shot in the back by one of the Morris gang, likely Willis or Mitchell, though it could have been any one of them. No one knew for sure. Anna attended five separate hangings just to make certain. She knew how to conduct business and run the jail, but the lush of a deputy was no account. His drinking went into high gear when the watchful sheriff died, and the town suffered. That all changed with Scotch Richards, a wanted man if ever there was one. Word spread that the town was lacking a lawman, and Scotch decided to take advantage. He figured the saloon in Red Boulder to be an easy hit, and soon enough Anna’s benefactor lay dead behind the bar. But a young boy on an errand saw what was happening through the saloon doors and ran to the Sheriff’s office. The deputy was passed out and Anna was sewing a pair of mukluks from a deerskin she had harvested herself. When the boy entered, she was pulling a sinew through a hole with a bone needle. “Stay inside here,” she ordered. Anna knew Scotch would be on his mount any second now, but she was dead if he spotted a gun on her. She grabbed her bola from the wall and stuffed it in her sewing bag. When she got out onto the street she saw Scotch on his grey mare thundering down the road in her direction. As he passed she let loose the bola. The horse’s front feet tangled and Scotch was thrown hard. He lost his gun but she could see him moving toward it. She ran flat out for him. Before he reached the Colt she pounced on his back and drove the bone needle into his neck, again and again. A wounded animal is the most dangerous thing, her father had always said. Anna felt the old instincts return. Soon a crowd had gathered. Her white blouse was a mess of blood and her face was covered in gore. A woman offered her a kerchief and Anna wiped her face clean, revealing her tattoos once more for all to see again. Still in her hand, the bone needle dripped blood into the street. That was long ago. Anna had been sheriff ever since. During one of the worst snowfalls ever to hit the region, Emma’s House of Pleasures was robbed. The thief said he was a rail worker, a Russian just staying the night before he left to supervise a gang of Chinese laborers. He took a girl first. Then he took the till at gunpoint and lit out. Miss Emma badgered Anna to get a posse assembled and go after the man. But Anna said it was best to wait until dawn. Emma was furious. A dogsled was an unusual thing to see around Red Boulder. It was early, but the animals made a racket as they pulled. Those who rose in time saw the sheriff in her parka barking out commands to her team. She cut a grim figure with her whip and her black mask slit only at the mouth and eyes. In a holster attached to the stanchions of the sled was a .22 single-shot rifle. She carried some kindling and dried wood, too. Pinned to her parka was the gold star. Anna knew that if she could keep her quarry running in the flatlands, she would have an advantage. For hours she followed the trail, and when she finally fed and watered the dogs at a little brook, she saw that the distance between his hoof falls had shortened. The horse was tiring in the snow. When her dogs balked at crossing the brook, Anna lashed them furiously until the lead dog finally dove in. The girl was tired and hungry. 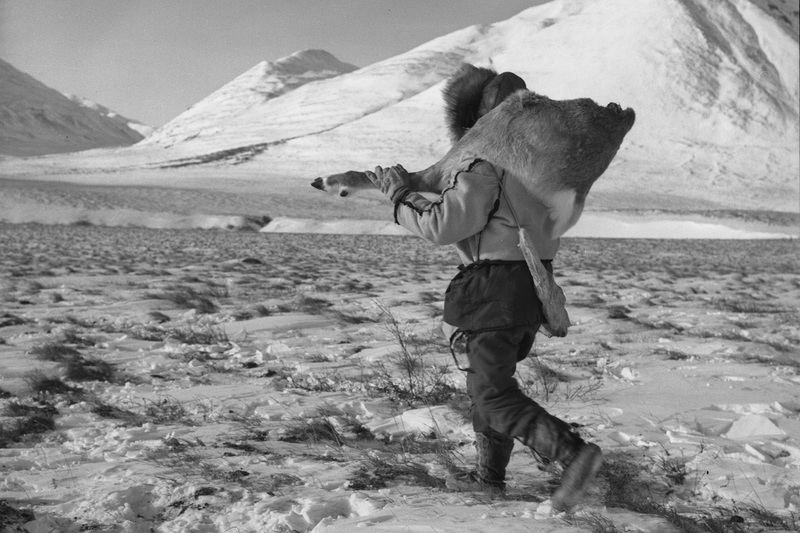 Her father had made a tactical error in following the caribou so far out. He said, “We must kill this caribou. It’s tired, you can see by the tracks, but he seems to keep on going. I wonder if he’s trying to kill us. This is a spiteful caribou.” He thought about eating one of the dogs, but the others would need food to pull. No, they must kill the caribou now. They must keep going. At dusk, Anna finally saw the man and his horse, a little spot on a rise a few miles ahead. She hoped he had heard her dogs, but she fired a shot with the .22 anyway. He wasn’t going anywhere soon, and at nightfall she tucked her feet under the sled and slept. But sometime late the dogs awoke her with horrible baying. At first light she followed the trail, and soon the team came across his horse. Now Anna knew why the dogs had barked so. Part of the flank had been butchered, but there had been no fire. She tried to beat back the snarling team but it was no use. With great effort, she managed to cut some meat for herself. This she cooked and ate deliberately. There would be no rush now. The dogs devoured the carcass. She saw the Russian long before the team got near him. Just like the caribou years ago, he had eventually wearied and collapsed on the ground. “Where’s the money and where’s your gun?” Anna demanded, the .22 in hand. Anna retrieved the bag of Emma’s money and the Russian’s Colt. “You’re Russian. Are you a fur trader?” she asked him. “I did, but not anymore.” He noticed her tattoos. “Are you Inupiak? I once did business with Inupiak,” he pleaded. The wind howled and blew a blinding gust of snow across the plain. The Russian knew he was as good as dead. He figured it was time to settle accounts. “Anka,” she said. And he turned away from her. A shot rang out and reverberated across the plain. Cordite hung in the cold air for a moment and the dogs bayed furiously. Anka looked at the sky. The snow would be on them soon. Then she remembered the storm that waylaid her and her father years ago. Only because they took every last bit of meat from the animal did the dogs survive those several days. She took an ulu knife from her sled and moved toward the body. Bio Chris McGinley has appeared in MYSTERY WEEKLY, RETREATS FROM OBLIVION, TOUGH, SWITCHBLADE, PULP MODERN, HARDBOILED (forthcoming), the ID Press crime anthology (forthcoming), and on a host of crime writing sites like Shotgun Honey, Out of the Gutter, Near to the Knuckle, and Yellow Mama. He teaches middle school in Lexington, KY.